The Dutch market has always been trendsetting when it comes to modifications to excavators. The Beco Group gained a lot of experience in this area over the years and is increasingly playing a major role in domestic and international demand. For the Beco Group, it is an everyday occurrence to increase the weight of a counterweight, to make a cab tiltable, to make an undercarriage hydraulically adjustable or to extend a front. Abroad, these modifications are a relatively unknown phenomenon, but the demand for them is increasing considerably. In particular from countries such as Germany, Austria and Switzerland, there is increasing interest in saving weight primarily for transport by road. The Beco Group has several options for this, such as making the counterweight removable or detachable and applying a built-in boom quick-release for separate (and therefore lighter) transport. Recent projects are among others a combined lift / tilting cabin and a hydraulically detachable counterweight, both for a client in Germany. The Beco Group is proud to be able to call itself a Preferred Supplier for VOLVO, KOBELCO, HITACHI and CATERPILLAR. From 8 - 14 April 2019, the Beco Group will be present at the international BAUMA exhibition in Munich, Germany. In addition to MODIFICATIONS, the Beco Group also presents itself on the Bauma with GRABS, ATTACHMENTS and TRANSPORT. These departments provide a complete range of grabs for recycling, waste processing and dredging, equipment for excavators, wheel loaders and telescopic handlers and tipping trailers for agricultural and earthmoving activities. 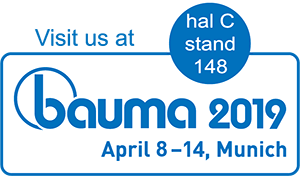 We would like to welcome you to our stand 148 in hall C4 at the Bauma to inform you about the possibilities we can offer you and about the latest trends.